I had some really amazing Uncles growing up. One in particular who was fantastic and also got stuck babysitting me often. He had tickets for a concert, he was supposed to take a date...alas he had to watch little me. Rather than giving the date the tickets, because clearly she wasn't as great as me...he took me. To see the Beastie Boys. It was the license to ill tour. Honestly I remember very little about it. I recall him buying me the shirt you see here, which I still have and I still love. When I was little it was a dress on me, now...not so much. In fact, it doesn't get much wear anymore as it's a bit tight on the 'girls' and isn't a practical t-shirt at all. I recall being on his shoulders, the lights stick with me I loved how the place lit up and then the noise! OH so much noise. I think I had a good time? Probably? 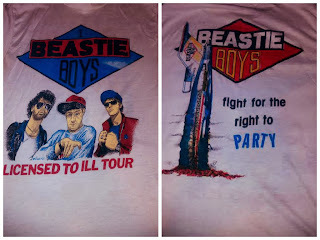 I still love the shirt, and I love that it was my first concert ever and that I was fighting for my right to party.